Kalakendra, a school for performing arts, was established in 2006 as part of the Kalakendra Trust (Regd). The Kalakendra Trust has been an initiative of Mrs. Ratna Lahiri, daughter of renowned flautist Late Pt. Pranab kumar Mukhopadhyay. The Trust has been working for the promotion of Indian music and dance among the young people of India. Kalakendra is a branch of Purabi Sangit Chakra (later known as Sanskritik Kalakendra), Kolkata which was established as a society for promotion of Indian music and dance in 1965. 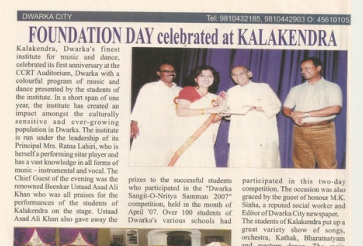 Kalakendra, Dwarka’s finest institute for music and dance, has been successfully running its first center in Delhi at Dwarka since 2006. In this short period of time, it has made an impact to the lives of hundreds of young children in Dwarka who have been initiated into the world of music and dance. Kalakendra supports physically and mentally challenged students to overcome their difficulties through the serene impact of musical notes. It is also dedicated to create an awareness of the multitude of benefits that music offers, even to the economically weaker sections of the society.